His tenure in the emerging neighborhood of Boyle Heights was short, just under a decade, but the mark John E. Hollenbeck made in the community and in the Los Angeles area generally was notable and is still maintained in some key ways. Hollenbeck was born in Summit County, Ohio, south of Cleveland and near Akron, in 1829 and was descended from Dutch settlers of New York from the mid-17th Century. His family relocated to Illinois in 1845, a common occurrence as persons from the "Old West," meaning places like Ohio moved further west to new opportunities. Hollenbeck, who generally went by his middle name and was known as "Ed," didn't take too well to his new home or to farming and convinced his father, also named John, to let him go back to Ohio to pursue his career. By the end of the 1840s, Hollenbeck had taken up the occupation of machinist and worked for a time for a small firm called Bell and Cunningham. In the 1850 census, listed as Edward, the 21-year old machinist lived with another family in the community of Tallmadge near Akron. Meantime, his family remained in Pecatonica, Illinois, northwest of Chicago close to Rockford and not far south of the Wisconsin border. The uproar caused by the California Gold Rush made its way throughout America and much of the rest of the world and hordes of gold seekers made their way to the new El Dorado. Included was an older brother of Hollenbeck, Alphonzo, and young "Ed" himself. In 1850, probably very shortly after that census was taken, he made his way to New Orleans and sailed for Panama. Like many travelers through the tropics, he took ill, however, after the steamer he was to take to California broke down. Soon out of funds, Hollenbeck was compelled to remain at Panama to work and earn money on steamships to hopefully continue his travels. At the end of 1851, he migrated to Greytown, Nicaragua and soon opened a store, eventually abandoning his plans to search for gold once he was well established in Central America with his mercantile business, owning a steamship, contracting to supply wood to steamers, and operating the Nicaragua Hotel. Eventually, he owned a fleet of ships to carry travelers, cargo and government mail and became very successful. 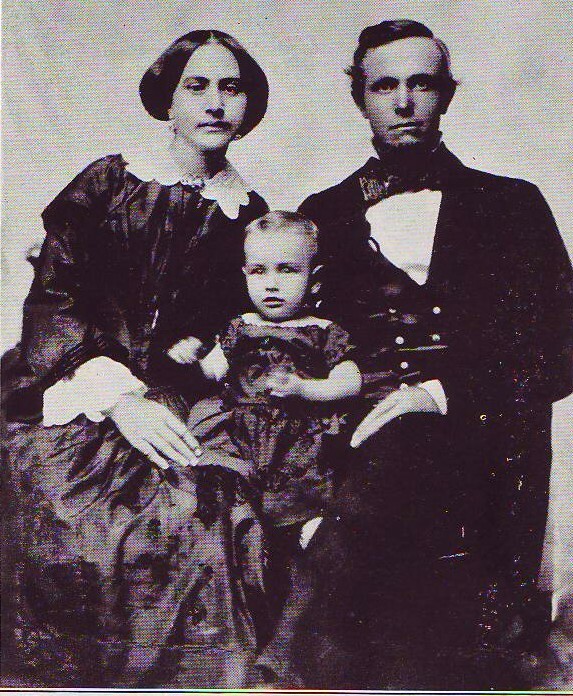 John, Elizabeth and John, Jr., ca. 1856, not long before boy, the only child of the Hollnbecks, died. He also had a partner in this, especially with the hotel, where he met Elizabeth Hatsfeld, a native of Mainz, Germany, who went to Central America from New Orleans, where she had lived since childhood, and became a partner and manager in the hotel before Hollenbeck bought it. Elizabeth had been twice married and widowed and in March 1853 she married Hollenbeck. With her financial acumen, they were an apt team in the hostelry business and life was generally good in Nicaragua, but there were problems. One was that they welcomed a son, John Edward, Jr., into their life at the end of 1854. Fearing that the tropics might be dangerous for the young one's health, they took him back to the United States and placed him with Hollenbeck's family in northern Illinois before returning to Nicaragua. In summer 1857, however, a diptheria epidemic broke out and took the two-and-a-half old child. The couple never had other children. Another issue was American filibustering in Central America, principally that of William Walker, whose fanatical and violent dream of establishing his own empire caused havoc in Nicaragua; in fact, the Hollenbecks were taken prisoner. When Walker was captured and executed, the Hollenbecks were released, though much of their property had been destroyed. In 1860, the couple decided, having been successful in reestablishing themselves in Nicaragua, to sell out and go back to the United States, specifically Missouri, but the onset of the Civil War led them to believe that they would do better back in Central America so they returned. Hard work in the tropics also meant frequent exposure to ill health, but his enterprises in transportation and shipping were doing well through the 1860s and first part of the 1870s, though California always remained in Hollenbeck's sights. This in mind, he visited Los Angeles in 1874 when the town was in the midst of its first development boom and it was decided by he and Elizabeth that they would make the small, but growing, city their home. Hollenbeck deposited $25,000 in the bank of Temple and Workman and returned to Nicaragua to close up his affairs for permanent settlement in Los Angeles. 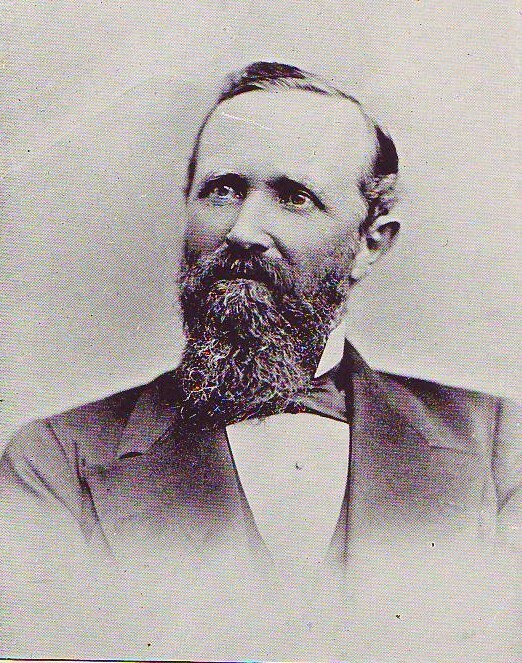 He and his wife arrived in the town in March 1876 to learn that a financial panic emanating from San Francisco, due to overspeculation in silver mining stocks in Virginia City, Nevada, had engulfed Los Angeles and the poorly-managed and undercapitalized Temple and Workman bank had failed, taking his money with it. Nonetheless, Hollenbeck went ahead and invested heavily in local real estate, having had an agent star tin 1874 with acquisitions that eventually totaled nearly 7,000 acres. This included about 550 acres of Rancho San Antonio a few miles south and east of Los Angeles; over 5,000 acres on the Rancho La Puente, half-owned by William Workman of the ruined bank; several properties in downtown Los Angeles; and an investment in the new community of Boyle Heights, recently laid out by William H. Workman, nephew of the failed banker, and others. With nurseryman and orchardist Ozro W. Childs and former governor John G. Downey, Hollenbeck lent his support for the purchase by the State of California for what became Agricultural Park, now Exposition Park. This was in 1880, the same year a Methodist college was started adjacent to the new park site--the school became the University of Southern California. In downtown, Hollenbeck acquired, in early 1879, a lot at Spring and Second streets. Five years later, he built a two-story hotel, naturally called The Hollenbeck. A few years after his death, Elizabeth added two more floors to the structure, which was a well-known hostelry for many years in the city. 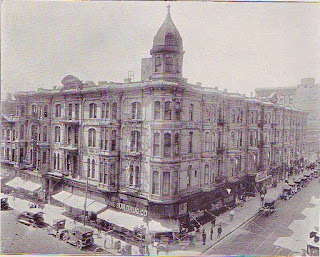 The Hollenbeck Hotel at Main and Second streets in downtown Los Angeles. 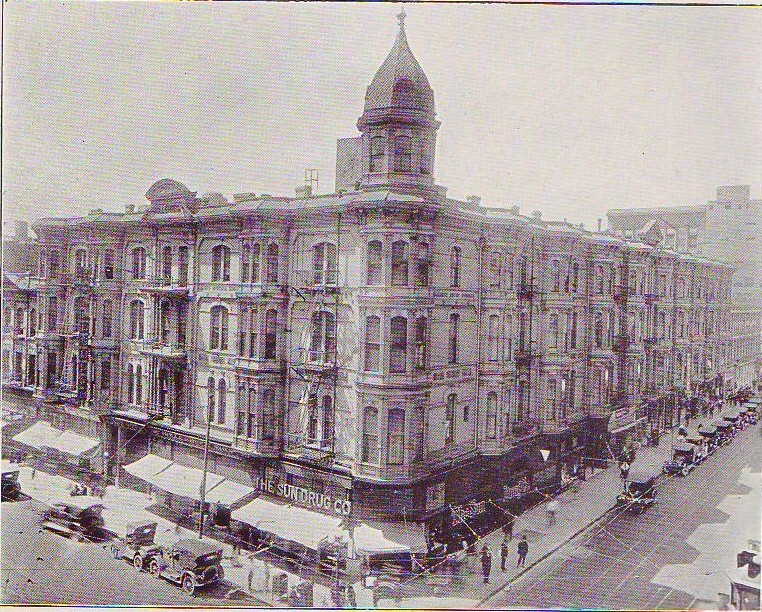 The building was demolished in 1933. He also became the majority owner of the Spring and Sixth Street Railway, which was the first streetcar project in Los Angeles when it debuted in 1874 due to the involvement of real estate enterpreneur and District Court judge Robert Widney, F. P. F. Temple (in whose failed bank Hollenbeck had deposited that $25,000) and others. Later, Hollenbeck became a principal in the Main Street and East Los Angeles line and invested, shortly before his death, in the West Second Street cable railroad line. Hollenbeck served on the Los Angeles City Council in 1878 and that year was a founder of the Commercial Bank of Los Angeles, of which he was president. Two years later, he became the first president of the First National Bank of Los Angeles. As to Boyle Heights, Hollenbeck acquired a section, or 160 acres, of the new community from its founder William H. Workman at a time when the local economy was depressed and the new enterprise struggling. As Workman's daughter, Mary Julia (later a prominent educator, social worker and civic activist) wrote, "My father had carried on a lone struggle to secure the water and to develop the hill land until dear Mr. Hollenbeck came. From that day, father had not only a strong personal friend but a most able and far seeing collaborator." According to her, Hollenbeck advised Workman to open more east-to-west streets from downtown to Boyle Heights, with only First and Seventh then crossing at that time. 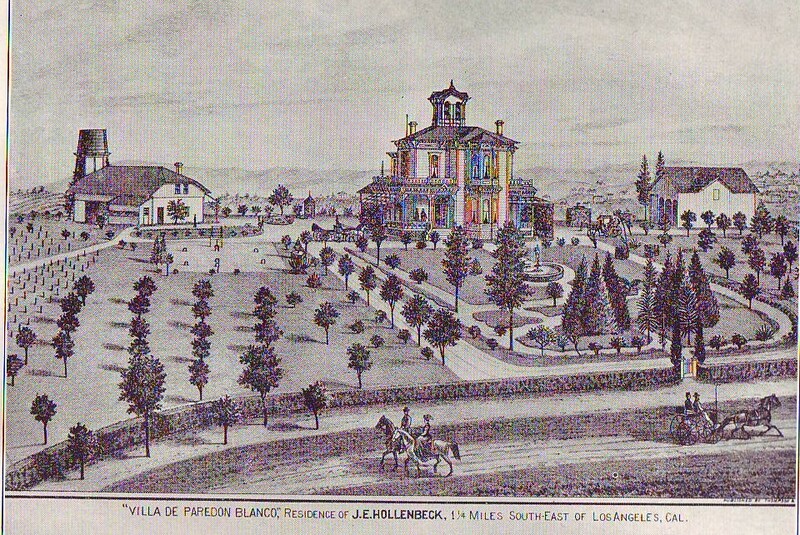 The Hollenbeck residence, known as the Villa de Paredon Blanco, was a large Italianate-style house on the bluff (Paredon Blanco) overlooking the city and it was surrounded by the kind of lush, varied landscaping for which wealthier Angelenos were becoming increasingly known. Hollenbeck also encouraged family members to join him in his new hometown. His brother Alphonzo actually was here slightly before John, but died in Los Angeles in 1873. When John and Elizabeth came permanently to live in Los Angeles, they had left Central America for the East Coast, taking in the American centennial exposition at Philadelphia. On their way west, they invited Hollenbeck's father to live with them and they all took the transcontinental route from the Midwest to the Coast, though the elder Hollenbeck took sick on arrival in California and died in the northern part of the state. The oldest sibling, Silas, migrated to Los Angeles in 1882 and lived there until his death about two decades later. Then there was John's only sister, Susan, who was first married to Chester Wells in Illinois and with which she had three children. After Wells died in 1866, she married James G. Bell, a Kentucky native who had been friends with John Hollenbeck, and who also a widower with three children. Together, the couple had two children, Maude and Alphonzo, the latter named for Susan's brother. 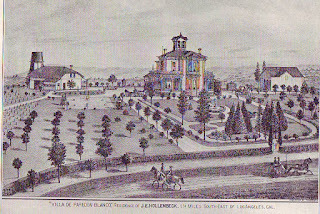 The Bells came to Los Angeles at the time that John and Eliza migrated here and they obtained 360 acres of the same Rancho San Antonio in which Hollenbeck had bought property. James Bell helped develop a community named Obed, but which later became the town of Bell. Bell Gardens also became a town derived from the family's involvement in that area. The Bell family became even more prominent through Susan Hollenbeck and James Bell's youngest child, Alphonzo, who became a real estate investor and, quite luckily, an oil magnate, through an investment at Santa Fe Springs that was not made with black gold in the forecast, but which was there in huge amounts. Alphonzo Bell went on the create the upscale community of Bel-Air and developed portions of similar tony areas, like Westwood, Pacific Palisades and Beverly Hills. His namesake son was an eight-term Republican member of Congress, representing the same Westside area of which his father had developed so much. Finally, James Bell was a founder of Occidental College, when it opened in Boyle Heights in 1887. Daughter Maud was one of the first two graduates of the school and Alphonzo, Sr. and Jr were also alums of the school, now in the Eagle Rock neighborhood of Los Angeles. John Hollenbeck had only been in Los Angeles as a permanent resident for just under nine years when he was stricken by a sudden stroke and died on 2 September 1885. He was only fifty-six years old, but had lived, by any standard, a remarkable life from rural Ohio to the tropics of Central America to the nascent city of Los Angeles, achieving significant wealth and power, but also struggling through political turmoil, the death of his only child, and other adversities. 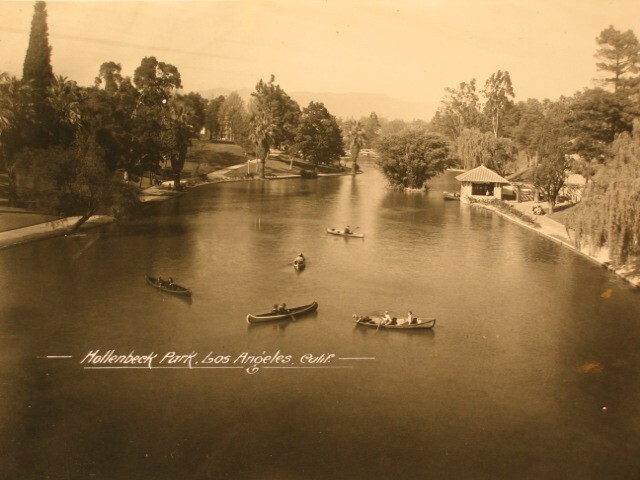 A circa 1920s view of boaters at the lake in Hollenbeck Park. From the collection of the Workman and Temple Family Homestead Museum, City of Industry, California. In his honor, his widow Elizabeth and friend and Boyle Heights business partner William H. Workman donated portions of their property to the city for the creation, in 1892, of Hollenbeck Park, which is one of the most notable features of Boyle Heights. In 1896, the Hollenbeck residence was refashhioned into the Hollenbeck Home for the Aged, now Hollenbeck Palms, a retirement care facility that is approaching 120 years of operation. The Hollenbeck station of the Los Angeles Police Department also represents his legacy of involvement in the community, which was actually renamed Hollenbeck Heights for a brief time in the 1920s (as covered in this blog previously.) Out in the eastern San Gabriel Valley, there is a Hollenbeck Avenue in West Covina and Covina and a second Hollenbeck Park, this in Covina. In Huntington Park, there is also a Hollenbeck Street. Boyle Heights certainly would have continued on if there hadn't been John Edward Hollenbeck's involvement in it from its earliest days, but it would not have been the same. Ironically, he died the same year the transcontinental railroad directly reached Los Angeles and ushered in a land and population boom that greatly transformed the city and Boyle Heights in ways, to a large extent, that Hollenbeck evidently had foreseen. The neighborhood has changed a great deal since then, but Hollenbeck deserves to be remembered for his early active efforts in Boyle Heights. Information for this post was obtained from William Stewart Young's 1934 book A History of Hollenbeck Home, Thompson and West's Illustrated History of Los Angeles County, California (1880), and genealogical material found on Ancestry.com, among others. Contribution by Paul R. Spitzzeri, Assistant Director, Workman and Temple Family Homestead Museum, City of Industry, California. Alphonzo Hollenbeck was my 2nd great grandfather. Thank you for the writeup here. Hi Steve, thanks for the comment; are you descended also from James Bell and Alphonzo Bell? I was able to trace my linage through Alphonzo! Alphonzo -> George Edward Hollenbeck -> Wilfred Flesher Hollenbeck -> Millie (Hollenbeck) Sloan. Millie is my grandmother!